There are two types of chamomilla in use for health conditions: The roman type and the German type. The two types are believed to affect the body in very similar ways, the German type is more regularly used in the U.S.
Latin Names- Chamomilla recutita, Matricaria recutita. Adults and children have used Chamomilla for many, many years. I drank a lot of it when I was growing up and so did my mother. It is used to treat diarrhea, upset stomach, gas, anxiety, (see herbal remedies for anxiety) and sleeplessness. It is used to treat mouth ulcers and skin conditions that have resulted from cancer treatment. chamomilla is used to create, capsules, liquid extracts, teas and tablets. Additionally it can also be as a skin cream or ointment or a mouth rinse. It is also used as a mouthwash against oral It has acaricidal properties against certain mites, such as Psoroptes cuniculi. Healing times increased in animals with wounds. According to researchers in the UK and Japan, drinking chamomilla tea on a daily basis could help stop complications of diabetes, this includes, nerve damage, loss of vision, kidney damage. Researchers fed diabetic rats chamomile extract for 21 days and then compared results to animals on a standard diet in a controlled environment. 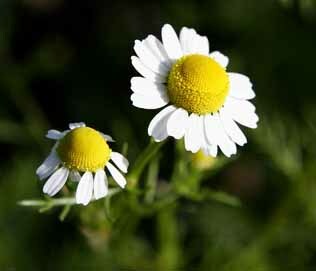 Results showed that the animals that ate chamomile extract had a significant decrease in their blood glucose levels, compared to those on a standard diet. Sorbitol and ALR2 enzymes are connected with amplified diabetic complications, the chamomilla extract showed significant inhibition in both of these. You are more likely to experience an allergic reaction if they also have allergic reactions to plants within the daisy family. Those plants include marigolds, ragweed, chrysanthemums, and daisies.